Fantastic place to stay in a beautiful town. Great breakfast! 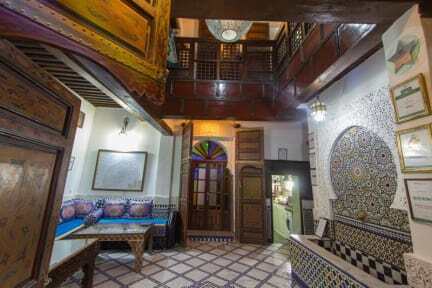 Best place ever in Fez! Loved it.. 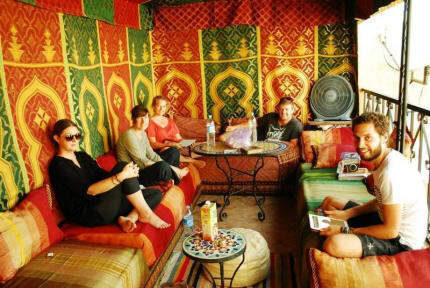 I was kicked out of another hostel who overbooked and was left stranded in fez, these guys welcomed me in a heartbeat, and their place was amazing, very very comfortable dorm, heat, nice shower, hot water. It is also right in the medina, very convenient for food. Amazing stay! Double room was very cozy! Staff very helpful and friendly. Air con+ hot water available, hair dryer and all other small things that make travelling a bit easier. The hostel is tucked away from the main street, which is a great advantage. As far as facilities go, everything was spotless clean. It was, by far, the most plentiful breakfast I’ve had. Would recommend it. Nordin and Esam were amazing hosts. Super friendly and welcoming. The place was cozy and it was tucked away in a small alley. Everything was clean and in working condition. The 2 best things about the hostel was the staff and of course the breakfast. Simple accomodation which is massively over-rated. This place is a 7/10 at absolute best. Rooms are very dark, bathrooms tiny with no power outlet, pillows are too big and rock hard, there is no social atmosphere, and the whole thing isn't neccesarily very clean. Once inside, its hard to even know what the weather is like outside because there's no windows. HOWEVER - The staff are friendly, the location is good (if you want to be in Madina), the WiFi works well, and the breakfast is huge. Got an email from them the day I was suppose to check in saying that they are moving me to a new location. Which overall would of been good except for the cockroaches in the bathroom. They also offered me food which I am now confident was the cause of my food poisoning as I have kept to pre packaged foods with the exception of said food.